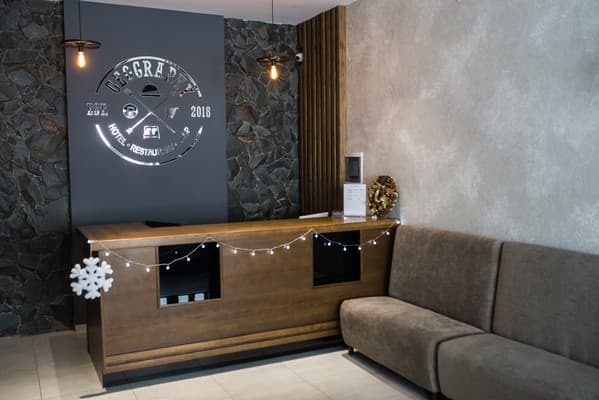 Hotel "GEOGRAPHY" is a new place located near the city of Rivne. 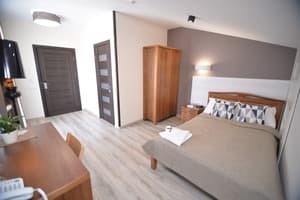 Rooms in the hotel “Geography” are designed in contemporary style and equipped with Smart TVs, new furniture, air conditioning and telephones. The hotel room inventory consists of 26 rooms of different categories, namely: single, double standards and junior suites, family rooms. All rooms are equipped with a high-quality plumbing and showers. Furthermore, the bathroom has all the necessary cosmetics for guests. 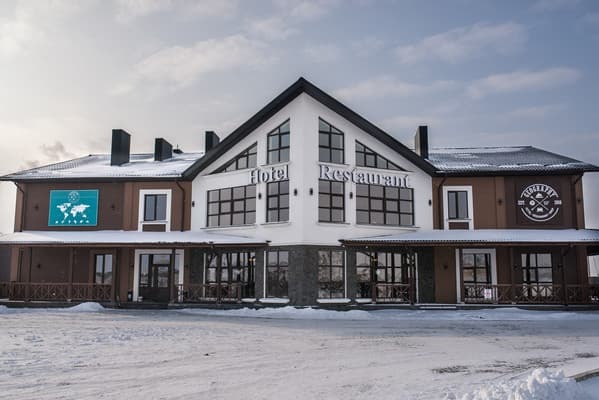 The hotel offers excellent service and the best value for money. 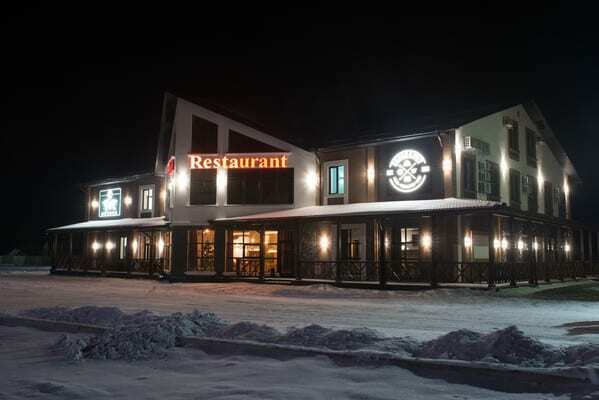 The hotel has a 24-hour restaurant. Compared to other hotels, our guests receive more for the same money. The hotel always welcomes its guests and highly appreciates their opinion. Description of the room: TV, one room, new modern furniture, comfortable bed, air conditioning and telephone. 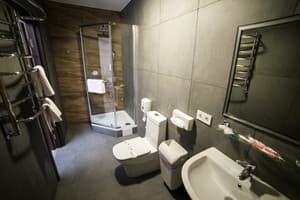 The bathroom is equipped with a shower cabin, brand new plumbing and necessary cosmetics. 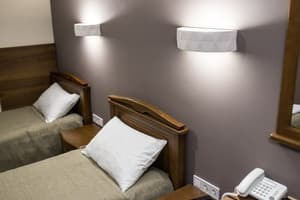 Description of the room: TV, one room, new modern furniture, comfortable double bed or two single beds, air conditioning and telephone. 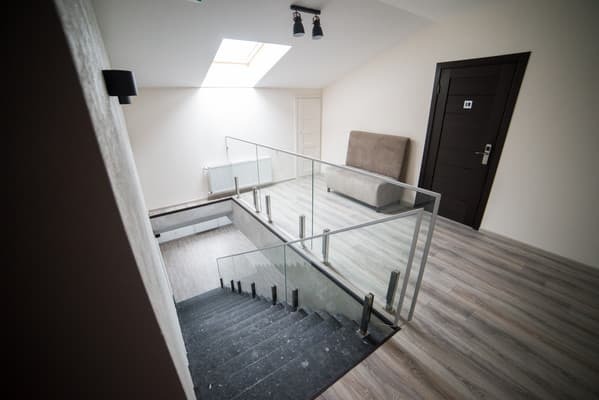 The bathroom is equipped with a shower cabin, brand new plumbing and necessary cosmetics. 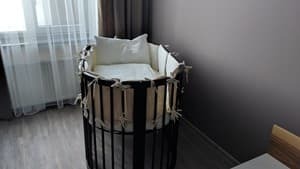 Description of the room: TV, one large room, new modern furniture, comfortable double bed and one single bed, free baby cot for children under 3 years, air conditioning and telephone. 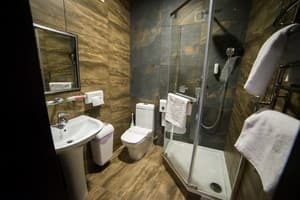 The bathroom is equipped with a shower cabin, brand new plumbing and necessary cosmetics. The hotel provides accommodation guests with pets for an extra charge - from 100 UAH. (The hotel reserves the right to refuse the guest accommodation with the animal if the owner did not provide a veterinary certificate of vaccination of the animal and if the animal is dangerous to other guests of the hotel) The hotel does not require extra charge for children, unless a separate extra bed is required. For other occasions there are family rooms with three sleeping accommodations. The hotel has a restaurant with delicious gourmet cuisine without GMO and at moderate prices. True culinary masterpieces of the best quality and fresh products from the masters of their craft are waiting for our guests. The restaurant is open 24 hours and provides room service. 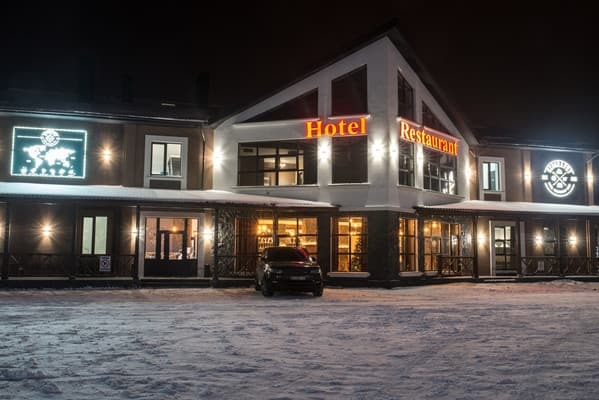 “Geography” hotel is located near the city of Rivne in Veresneve village, 7 Serpnya 1a street. On the highway M-06 "Kyiv-Chop, 338 km"